Add or subtract the integers. Simplify the integer equations using addition and subtraction operations. Activity based exercises and word problems are included. 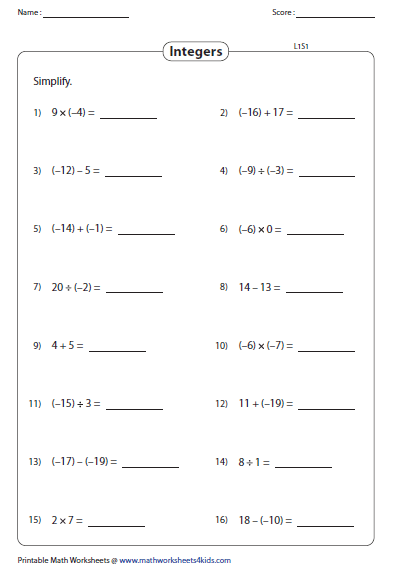 In these worksheets, multiply and divide to solve the problems. Colorful charts are presented. Interesting exercises and word problems are included. Learn more about integers by comparing and ordering them. Absolute value and opposite value concepts and MCQs based on it are given for practice in these worksheets. In these worksheets, represent the integers on a number line, add and subtract integers using number line, writing equations and more. 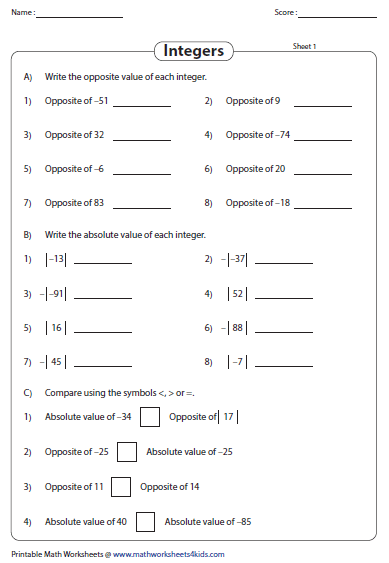 Integer worksheets have printable practice sheets to represent them, find the opposite value and absolute values, perform mixed operations, and to identify statements as true or false. 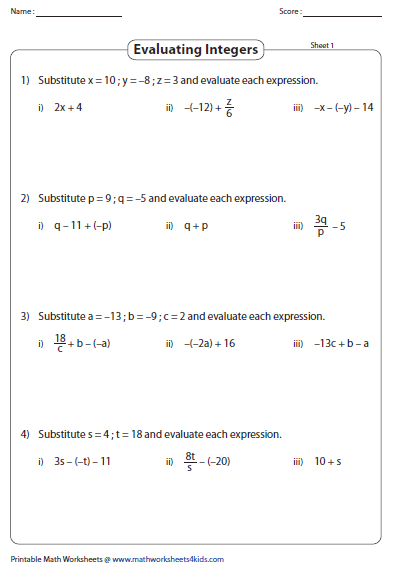 Multiple choice questions and simplification of integer expressions are also included here. 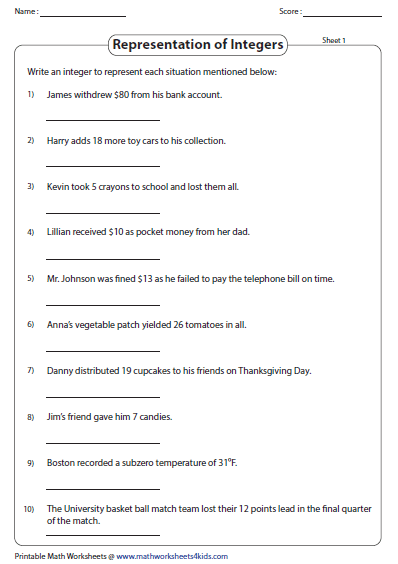 These integer worksheets are based on simple real-life scenarios. Read each statement to represent the integers. Each worksheet has ten statements. 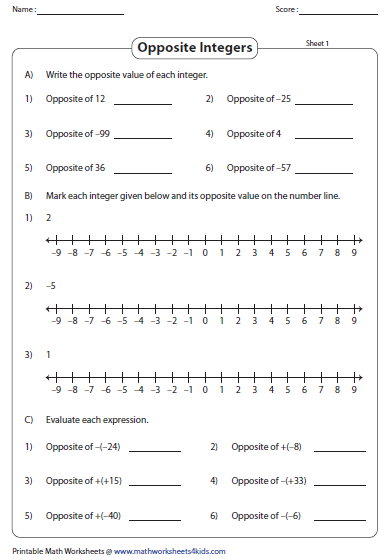 Write the opposite value of integers and also mark them on a number line in these worksheets. Three different sections are here for practice. In the first two sections write the opposite value and absolute value of integers. Compare the opposite and absolute value of integers in the third section. 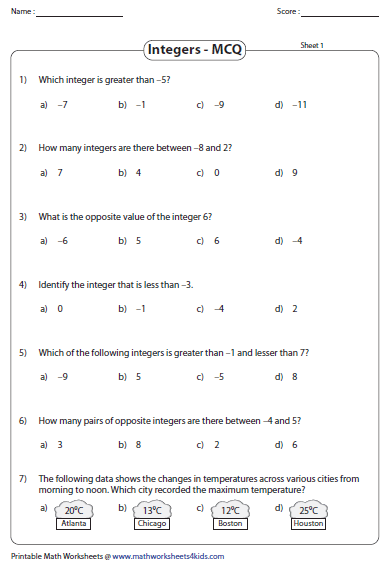 Reinforce students' knowledge on integers by practicing these multiple-choice questions. Each worksheet contains seven MCQs. 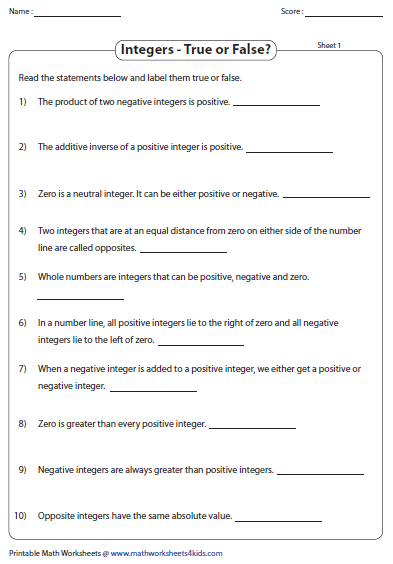 Ten statements on integer facts are given in these mixed review worksheets. Write true or false against each statement. Apply all the arithmetic operations to simplify the integer equations. Practice these two levels to get ample understanding of integers. In these integer worksheets, substitute the values of the unknown variables in the given expressions and evaluate them.